The excitement of your Lares trek to Machu Picchu will help you arise early for your pickup at 5:00am whether in Cusco or Sacred Valley. Within the hour, we will arrive at the ancient remnants of this truly awesome Pisac Inca Citadel. If you are able to take your eyes off the ruins and look up towards the skies, you will be memerized at the flight of the Caracara falcons hovering and circling in the endless sky. Our guide will share with you the history of the Pisac Inca Citadel in all its brilliance. Breakfast is served high above, looking down at the plunging gorges and awesome views of the Inca city and valleys. Driving onward for 40 more minutes to Huaran, we meet our horsemen and horses. Time to saddle up, boots on, and begin our first 3 hours gradually ascending to Cancha cancha, replenishing our energy for our trek ahead with a delicious lunch prepared by our trekking chef. Cancha cancha being the most isolated and self-sustainable community, traditional to the core, with no bus route or electricity. Make your connection with nature and the realness of life with the locals that share their homes. It would be of much appreciation to share some toys, old useful clothes, notebooks, fruit or any items with the locals. Two hours later, we have completed our first trekking day and arrived at our campsite. Boots off, time to enjoy afternoon tea with amazing views of the frozen Andean peaks. After dinner, our guide will show you the Inca’s constellations in which they depended on for their agricultural guidance and still do to this present day. Feeling all revved up to begin our second day and have eaten a delicious breakfast, we begin our 4 hour hike northeast, an intense walk accomplishing the three high passes to the highest point of our trek called Pachacutec Pass (4,700m /15,420 ft). This is when to pat yourself on the back and embrace the feeling of total exhilaration and self-achievement for making the summit. Compensating for the intense hike, the views of the rigid glaciers, amazing blue glacial lakes, llama herds, rugged valleys and undulating farmlands. After a time to enjoy the 360º views, we descend for an hour, taking lunch by the mirrored glacial lake, with its picturesque views of the Lares Valley with plenty of llamas and alpacas. After a siesta time, we descend for 2 hours until we reach our campsite located by the Quishuarani community, (3,700m/12,139ft). Taking the back roads to Machu Picchu Llama, where herders are readily available and the local indigenous people will open their hearts and interact with you in the Quechua language (Inca language). Your guide will act as your mediator to translate and teach you some Quechua language, and then you get to enjoy the stunning waterfall. At the campsite, everything will be ready. Enjoy afternoon tea time and dinner then snuggle in for a comfortable night sleep. Your adventure continues as you begin the most memorable day yet! We begin our ascension for 3 hours until we reach the Hullkiccasa Pass, (4,200m/13,779ft) getting a bird’s eye view of the reflections of the mirror images of the glacial lakes. Time to descend for 2 hours through the boundless farmlands and pristine lakes to the Cucani community. Connecting with the local indigenous children, we will visit their school and share in some quality time with the students. A little further, on we are welcomed into the natural volcanic hot springs for an hour to soak, have lunch and take a siesta. Time for our goodbyes for our remarkable chef and cowboy. With the body relaxed, the mind begins to sway toward preparing for the ultimate experience. We take our van for 2.5 hours to Ollantaytambo where we will have dinner at a tourist restaurant. At 7pm or 9pm, we take our train to Aguas Calientes, where we spend the night at our hotel. (private room with hot shower included) One more night to sleep before the big day! Bursting with excitement on your final surreal day, we take the first bus to Machu Picchu archeological site, making sure we tour every nook and cranny of this New Wonder of the World and UNESCO World Cultural Heritage Site. The Citadel of the Incas, Machu Picchu, what an unforgettable experience. Your guide will expertly direct you through the energetic ruins and its diverse main streets. Then on your own, you can wander around the town squares of the world’s spiritual center of Inca wisdom, as well as climb the intricately carved stone stairways. You can stay still and find the peace within as you sit in the pure delight of the moment. You will be given some time to walk to the Sun Gate or Inti Punku. Other optional activities in Aguas Calientes include a visit to the local museum or to the hot springs. When you are ready, you will descend to Aguas Calientes, have a leisurely lunch on your own, and later on board the train at 4:22pm for the return trip to Cusco stopping at the Ollantaytambo Train Station, where you will catch our private van back to Cusco and arrive at your hotel around 8pm. Transfer from the Airport to Hotel (it can be done on any date). Private guided tour in Machu Picchu for 2 hours. *** This price includes the extra personal porter who will carry your belongings up to 7 kilos, guided tour in Sacred Valley (Pisac Inca ruins) are included in the price and we will provide you with a duffel bag. ***The 5 person discount for the private trek is already factored into the pricing above. Group of 5 or more:$20 USD. All you need is to book the trek together at the same time. EMERGENCY HORSE is included in the price which can be ridden if you get tired or sick. PLASTIC RAIN pocho made by SAM Travel Peru is included. GUIDED TOUR INTO PISAC INCA RUINS: Enjoy and explore the amazing Inca city of Pisac which is one of the most important Inca cities of the famous Sacred Valley. BEST ITINERARY operated by Lares Trek Machu Picchu specialist only. The company owner’s was to create small personalized tours & treks strictly and only operated by local professional staff catering in PERSONALIZED and HIGH QUALITY SERVICE. We take pride in having a reputation as being a RESPONSIBLE & SUSTAINABLE tour operator. Our staff are our extended family. We ensure they are supported financially by paying them a good wage. We are proud of our team without them ,we couldn’t give the best service and lifetime experiences to our clients. In an effort to provide a more personalised service to our passengers, we, at SAM Travel Peru have a policy that our groups will not exceed 10 people. This sets us apart from other companies that operate departures with bigger groups. SAM Travel Peru is the only tour operator which treks OFF THE BEATEN PATH with the LARES TREK TO MACHU PICCHU, passing through the most isolated communities, ending at the hot springs. We are the only tour operator including the PISAC INCA RUINS on top of the Lares Trek to Machu Picchu — NO ONE HAS A BETTER DEAL than SAM Travel Peru. We are very proud of our guides! Highly professional, speaking fluent English, very knowledgeable, passionate about Inca heritage and history, dedicated to personal development, learning to ensure that you receive accurate and recognized theories about Inca and Andean culture. Fun loving, great sportsmen and well educated crew as well as holding a degree in: Archaeology, Botany, History or Anthropology. Some of them are great entertainers and the best “Salsa Dancers” on this side of Machu Picchu. Hiking the Lares Trek Machu Picchu with SAM Travel Peru is a life changing experience with a fully portered trek where your comfort and enjoyment are our first priority. We make sure that you get the best experience for your holiday in Peru while you interact with the locals, explore fantastic sites and re-discover remote ancient Inca towns and buildings. Having the opportunity to learn some words in Quechua and about the fascinating Inka history. Immerse yourself in the stunning landscape and simply feel the magic of Mother Nature (Pachamama) and the Andes. We carry your gear, prepare your meals, set up your tents avoid crowded campsites and take care of you while you sit back and relax. The food on the trek has been highlighted by all our clients they say “that it was better than in the restaurant’s. “Delicious and abundant gourmet style meals, Peruvian and International Cuisine are prepared by our professional and dedicated cooks from a mixture of local and exotic produce. If you are vegetarian or have food allergies of any kind, we can cater our meal to adjust to your needs. SAM Travel Peru honours any food restrictions.! SAM Travel Peru has always believed that we should “give back” to the communities, we pass by through when on our treks. Therefore, as part of our commitment to responsible tourism, we always do many social projects and hire locally. SAM Travel Peru is so proud to be able to support these people, not only employing them work but also to keep things at grassroots, to share with their families. This makes us happy to have this holistic approach with our highland employees and their families! You will be greeted at the Cusco airport and taken to your hotel, please ensure that you inform us of your flight details at least 14 days prior to trek´s start. Look out for our representative holding an orange board of SAM Travel Peru at the arrival terminal. The briefing will take place the night before the trek at 6pm at our office, which is located at Calle Santa Teresa Nº383 ; 303 (second floor) we are next to SUBWAY restaurant. Of course! During the Lares trek to Machu Picchu, your main luggage can be stored at our office or at your hotel, both are for free. FIRST, to book your Lares trek to Machu Picchu, we need you to fill out our booking form by clicking on BOOK NOW on our homepage or click here the link BOOK NOW. *** We will need each participant’s passport at the time of booking. They will be need, in order, to purchase tickets. SECOND, we require a deposit of $200.00 USD per person in order to purchase a permit for the Lares trek Machu Picchu. You can make you deposit by clicking on the VISA or PAYPAL symbols on the top of our home page, or you can click on the VISA or PAYPAL symbols on our booking page. MAY I CHANGE THE DATE AFTER THE TICKETS HAVE BEEN BOUGHT? Unfortunately the answer is generally No. Once the tickets have been bought the Peruvian government does not allow any changes so we can’t change any dates. Tickets are not transferable nor refundable. With alternative treks, we may be able to change dates for a fee depending on what has been already purchased. Please contact the office as soon as possible if you need to change your date. *** If you cancel your Lares Trek Machu Picchu, the deposit is not refundable at all! Yes! You have to bring your original passport and it is very important that it is the same passport you sent to us to book your Lares Trek, other entrances and reservations. The rangers will check your passport when you enter Machu Picchu. The train company will also check your passport before allowing you to board the train. In case, you are renewing your passport or changing your name, go ahead and send us your old passport information to secure your permit, and we can change it when you get your new passport number or updated your name for a fee of $25 USD per person. We must have a copy of your old and new passport to make the change. Before you change your passport keep a copy of your old one. If you do not wish to pay this fee you will need to bring both passports to Peru with you. You can enter Peru with your new passport but you will need to show both passports, old and new to be to enter Machu Picchu or the train. If you do not have both you will not be allowed to enter the Inca Trail, Machu Picchu or get on the train. They are very strict about this here!! WHAT IS THE WEATHER LIKE ON THE LARES TREK? The weather is very unpredictable and it’s difficult to foresee. You will have many different seasons as you pass through the numerous microclimates and will depend on the location. We highly recommend you dress in layers and good rain gear in your day backpack. In general, if you exercise regularly and spend 2 to 3 days in Cusco, or in the Sacred Valley , you will better acclimate. The recommended remedies for altitude sickness is WATER, COCA TEA and OXYGEN, IF NEEDED. Our guides are trained to treat you for Altitude Sickness. For more detailed information on Altitude Sickness click this link: Altitude Sickness. We offer the Cusco City and Sacred Valley tours that you can book while you are acclimating. Check out our day tours on our Main Page. The maximum group size is 8 persons. Usually our groups are between 2-6 persons. Sam Travel Peru specialises in SMALL, PRIVATE groups and provide a personalised service. The evening before you start your trek, you will be given a SMALL DUFFEL BAG to pack your clothes for the next four days. Your weight allowance is up to 7kg/14p. Your team of porters will carry your duffel bag for you, together with the food and camping gear. It’s important to be aware, that you will not have access to your items in the duffel bag until the end of each day, as the porters will always be ahead of the group. During the trek, you need a day backpack big enough to carry your personal belongings such as a warm jacket, a rain jacket, your camera, sunscreen, snacks, water, etc. Usually a 30 to 50 litre backpack is sufficient. IS THE LARES TREK DIFFICULT, DO I NEED TO BE FIT? The Lares trek is a 39 km hike through the Andes in the Cusco region. The maximum altitude reached is 4,700mt. On the second day of the trek, we climb two mountains. The trail is a fairly difficult trek and you should be well prepared and healthy prior to starting it. You have to be moderately fit and take regular exercise. In preparation: try walking 15kms a day or go to the fitness club in the months leading up to the trek. It is also important to be well acclimatized to the altitude. Try to spend at least 2 or 3 days in Cusco (3,350m/11,047ft) prior to starting the trek. ARE THERE TOILETS ON THE LARES TREK TO MACHU PICCHU? There are hot showers and hot water pools to soak in and relax on the 3rd day of your trek at the Lares Hot Springs. Be sure to bring your bathing suit. 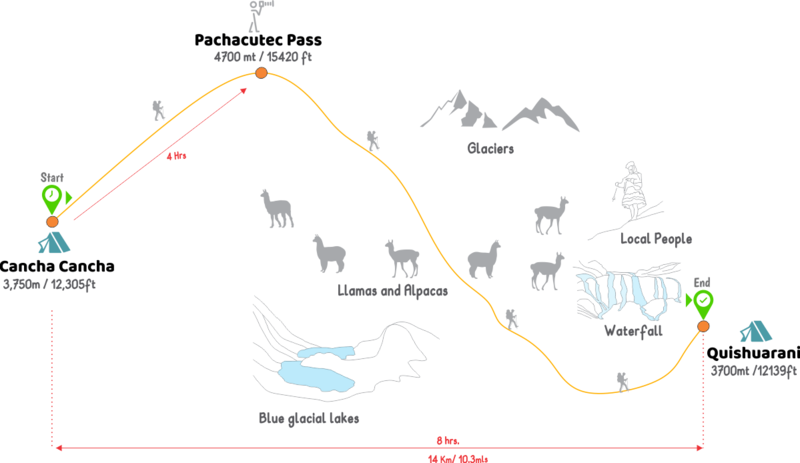 WHAT HAPPENS IF I AM UNABLE TO FINISH THE LARES TREK? In the scenario that you are unable to finish the trek due to a health issue, Sam Travel Peru will assist you to the nearest town for help with transportation. We always carry oxygen on the trek for any respiratory problems In extreme cases, a helicopter pick up can be arranged at your own expense. (Travel insurance required). There are no refunds in the unlikely situation that you are unable to finish the Lares trek. Generally, those who have to be assisted off the trail are taken to Ollantaytambo and if they recover quickly, they then continue the journey to Aguas Calientes (cost incurred by trekker) and visit Machu Picchu according to original plan. ARE WE GOING TO BE DROPPED OFF AT OUR HOTEL? Absolutely!! Hotel drop off is included in your trek package. If you have booked your hotel in the Sacred Valley like Ollantaytambo or Urubamba, we will drop you there too! The Vistadome train service has nicer seats, panoramic windows and ceiling. You will be offered snacks and a dance show will take place on board. The price is $57 USD per person which includes the transfer from Poroy train station to your hotel in Cusco. 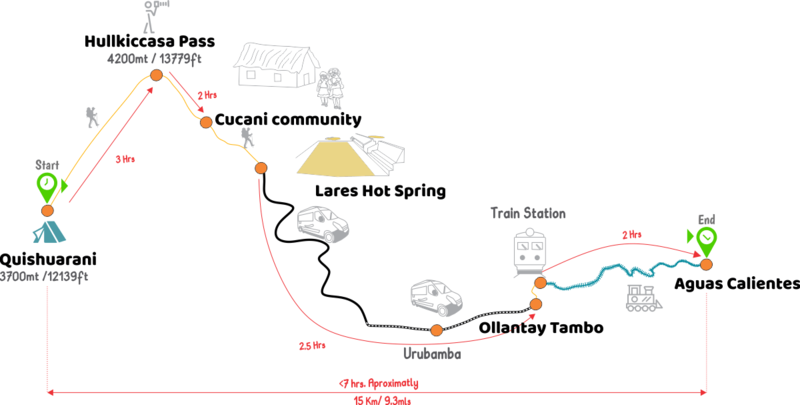 It is 2 hours by train from Aguas Calientes to Ollantaytambo and then another 2 hours from Ollantaytambo to Cusco by bus. If you upgrade to Vistadome, all the way back to Poroy, the trip lasts 3.5 hours, then 25mins by taxi to your hotel. Usually our clients are back at the hotel by 8pm. If you’re happy with the services provided, a tip – though not compulsory – is appreciated. While it may not be customary, it’s of great significance for the people who will take care of you during the Lares trek. It inspires them to give excellent service and is an entrenched feature of the tourism industry across many SAM Travel Peru destinations. Of course, you are free to tip as much as you would like, depending on your perception of the quality and the length of your trip. Remember, a tip is not compulsory and should only be given when you receive excellent service. Yes, we are a locally sustainable & responsible tourism operator. That incorporates universal principles of tourism: protect the environment and benefit the local communities by respecting their culture and religion. With this in mind, we have trained all our local staff to know and understand, respect the places and the local people. As a Direct Local Tour operator, we provide you with a duffel bag at your briefing and INCLUDE an extra porter who will carry up to 7 kgs or 14 pounds including your 2.5kg sleeping bag, mattress and extra clothing. Water: Please supply your own water until the first lunch stop. Please bring your water bottles.